Since I married into an Irish Catholic family, Saint Patrick is high on our list of Catholic Saints. My children love hearing about Saint Patrick, and now that March has rolled around, we’ll be spending a lot of time learning about Ireland, its heritage, and the man who worked to bring Christ’s message to the beautiful Emerald Isle. I’m thrilled to share this Saint Patrick unit study with you, for use in your home. 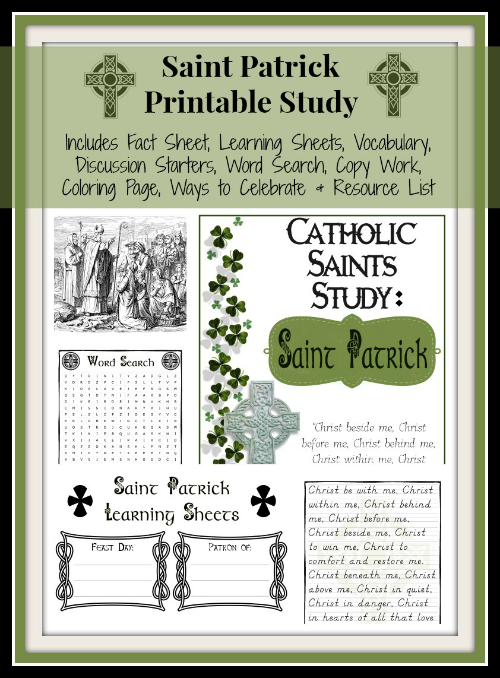 You’ll find facts about Saint Patrick, vocabulary words, discussion questions, copywork, and resources for learning about Saint Patrick. Don’t miss our fun Saint Patrick’s Day snacks and books to celebrate St Patrick’s Day, as well some of the resources we use to study Saint Patrick. Swinging by and spreading the love from the link up! I simply had to because of the St. Patrick’s theme of your title. I didn’t realize it was a unit study until I read the post. I have downloaded it by the way as we’re an Irish/Polish/Scottish/French Canadian (lol I know funny mix) Catholic family and I was looking for a more purposeful way of studying St. Patrick this year as my middle child keeps insisting on calling St. Patrick’s day “leprechaun day” *sigh*. Thank you so much for this!! Dianna, thanks for your website and ministry to share the faith. I also married into an Irish Catholic family and we have 5 children. My husband was born in Ireland. At the wedding his mom requested we keep the Irish heritage alive, so I do my best. The kids are eager for me to make Irish Soda Bread, which we call spotted dog in the next few days. Love your site. I’ve had this on my list all week. Thanks for sharing–I can’t wait to use it! What a wonderful resource for St. Patrick activities; thank you for sharing. Thank you so much for sharing on the After School Linky Party. I’ve featured your post in our St. Patrick’s Day Roundup! Can’t wait to see what you share this week!